Anyway, here’s yet another post that was written long ago and is just now being finished and uploaded…(sigh). 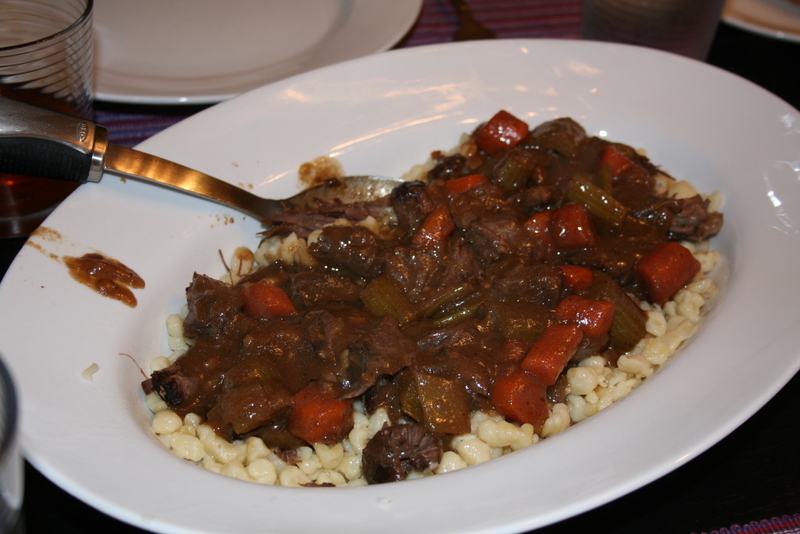 I made sauerbraten and spaetzle Friday night. Andrew and I traveled around Germany a year or so after we got married and have lots of happy memories of the country, the trip and the food. We’re BIG foodies; WHERE we eat on trips is potentially the biggest part, at least for me. Anyway, I saw a recipe for sauerbraten and homemade spaetzle in a Food Network magazine forever ago and ripped it out, knowing I would make it someday. Well, that day came Friday. 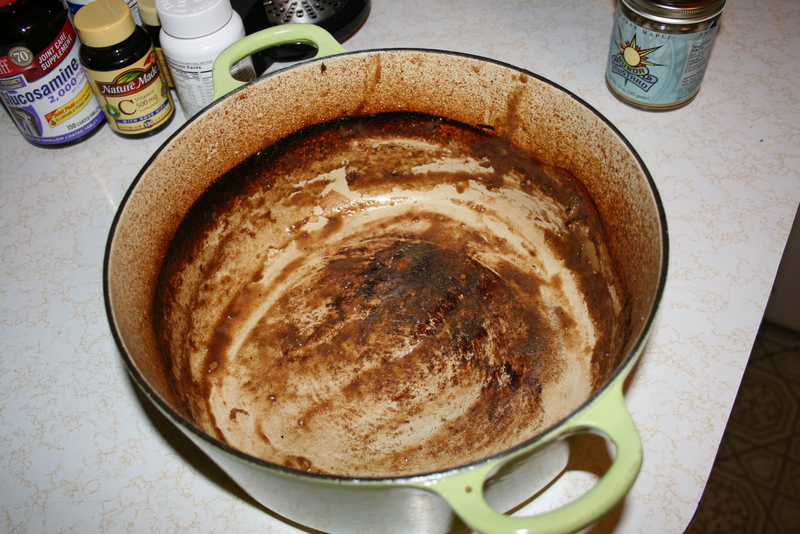 Actually, it started Tuesday by marinating the roast in a mix of red wine, beef broth, red wine vinegar and onions with all sorts of spices, to include juniper berries. Thank goodness Wegmans has juniper berries! I’ve been known to go on wild-goose chases for ingredients, and I don’t have that kind of time right now. Basically, sauerbraten is a roast with a bit of a vinegar-y flavor. We both really like it. It cooks in a similar way as well, so when I got home from school Friday, I took it out of the fridge and after a short “decompressing period” (not for the meat, for me) I started cooking. The sauerbraten was PHENOMENAL. Andrew announced it as a “top 10” and couldn’t get enough. The sauce was rich and thick with just the right “bite” to it. I served it with the homemade spaetzle; the recipe for which was featured on the opposite side of the page. I love doing that–making a whole ‘meal’ I find in a magazine, or making each component from scratch–it just feels better that way. However… Spaetzle, I have learned, is not for the weak. And I’m not weak, so I’m not sure who it’s for. Either that, or a spaetzle press is a mandatory accessory. Basically, you make an egg-y dough and force it through the large holes of a colander, while holding it over boiling water. Sounds OK, right? WRONG. The dough was so thick and springy that it was terribly difficult to get it through the holes, not to mention the awkward position of having to hold it over the stove. It took about 45 minutes and I thought my forearms were going to fall off my body. Never gain. Next time, I’ll look for it at Wegmans. I also made a “sweet hot” cabbage recipe Andrew loves. It’s another Food Network magazine find and since he won’t eat sauerkraut, it’s my go-to cabbage dish for meals with pork and apples or sausages or something. And anytime I make coleslaw I have to bring out all the cabbage recipes I can find; I refuse to buy pre-cut coleslaw mix, and cutting up those heads of cabbage yield SO MUCH. After making some coleslaw and this recipe, I still have a ton left, so I’m trying a sauteed cabbage recipe in a couple nights. Thankfully, other than drying out a bit, cabbage keeps for awhile in the fridge. 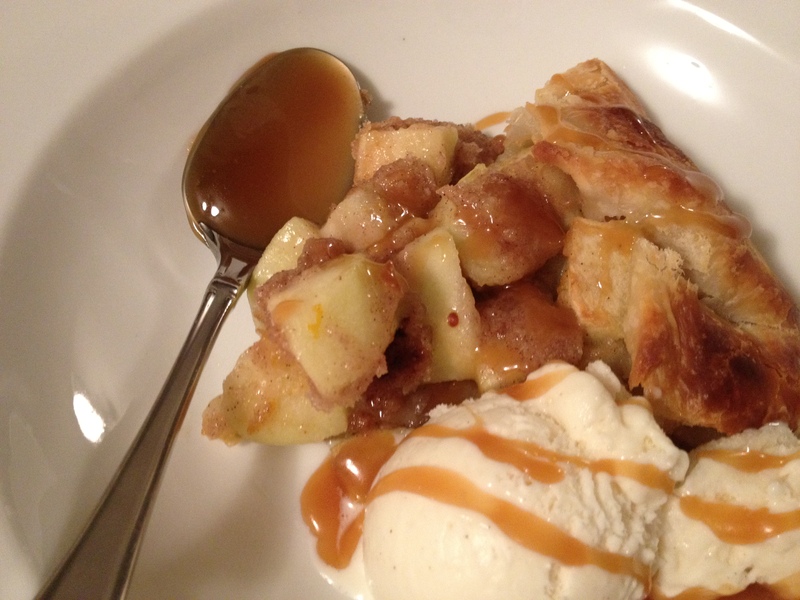 Streudel is such a German dish and Andrew loves it, so I thought I’d whip up an apple crostata with a pie dough I had in the freezer. Well, things never go as planned for me (go figure…) and dinner was later than I had thought, so I actually ended up making this a couple nights later when Carolyn and Ben came over for a movie. It actually worked out well; more people means fewer leftovers to tempt me! Today is my day “off,” which I hope will be filled with chemistry and present-wrapping! 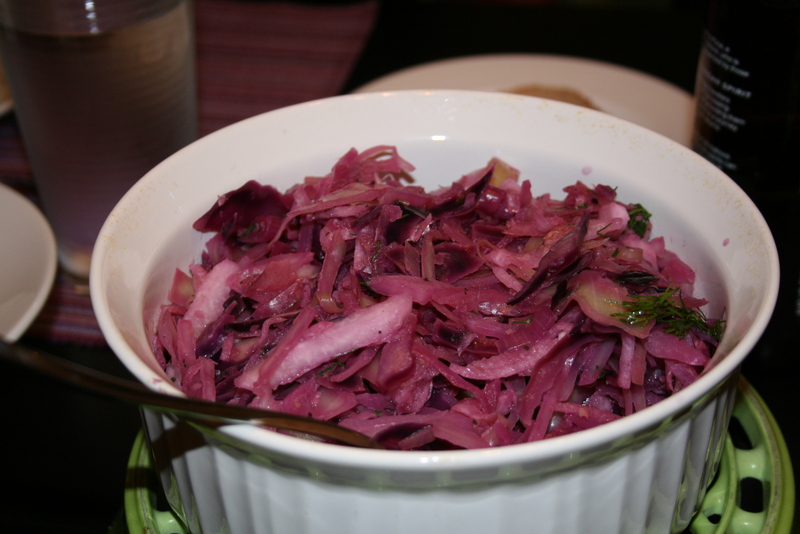 Posted on December 13, 2011 February 27, 2016 by thehealthypineapplePosted in Mains, Sides, SweetsTagged apple crostata, cooking, Dessert, ethnic food, german food, red cabbage, sauerbraten, spaetzle. I know exactly the recipe you used! I’ve got it saved for a rainy day myself- how funny!